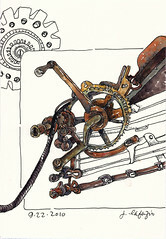 A challenge, drawing with pen (no pencil first) and a complex rusty something. Meditative, when it wasn't frustrating! Greens. There are a million different shades of green. In preparation for the online "Sketching & Watercolor: Journal Style" class, I'm planning a lesson just on greens. When I teach Sketching & Watercolor: Journal Style, I often start with a continuous line contour drawing, straight to ink, to remind the students to really look at the object, and to draw slowing. Indigo Moon. Finished. You saw the start of this here. 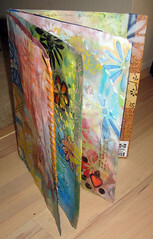 It's 16x14 inches and completely hand-stitched. 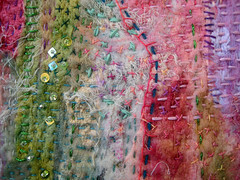 You can see details of the finished piece here and here and here. 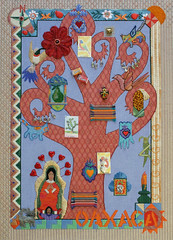 I'm going to the Houston International Quilt Festival this November. I'll be doing open studios and for the first time, Make It University. Here's the project I'll be teaching at MIU, working with Shiva Paintstiks and you'll make your own rubbing surface. Come by, say hi and put your name in the lottery to take the workshop. Mundo Lindo! 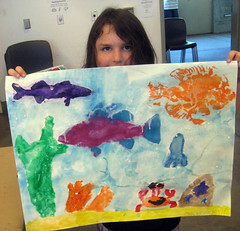 I created an afterschool art program 3 years ago, and it's one of the things I'm most proud of. It's free, to 4th and 5th grade kids, who attend Escondido schools, and are recommended by their teachers. Our new session started up yesterday with 27!!! kids! (The limit is 20) So, we'll be adding another session. 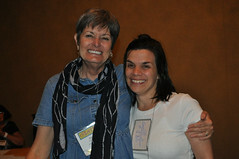 I post pics and write about the project every week on my Mundo Lindo blog. 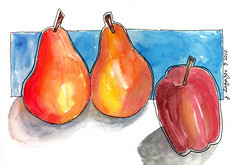 "Sketching & Watercolor: Journal Style"
Usually, when I teach "Sketching & Watercolor: Journal Style" I start with either a leaf or fruit. I'm teaching a 2 day workshop on December 2 & 3 at the San Diego Watercolor Society. 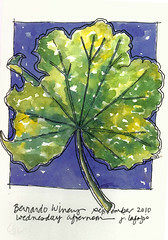 We'll start in the classroom, and then spend most of our time outside, drawing and painting small vingettes. It's geared for beginners, but everyone is welcome! 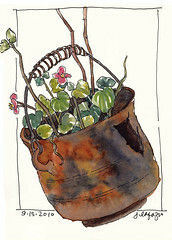 I'm preparing for the Sketching and Watercolor: Journal Style online class I'll be teaching. 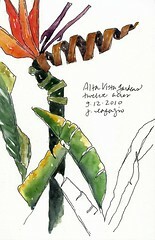 San Diego SketchCrawl today, at Alta Vista gardens. I'm teaching a 6 week online class in "Sketching & Watercolor: Journal Style," starting next month and also at San Diego Watercolor Society in December. 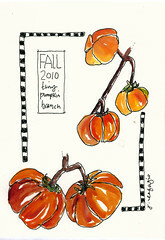 Another from the sketchcrawl today at Alta Vista gardens. Years ago, I did a very large painting of a banana blossom, it was fun to revisit the subject matter, this time start to finish about 45 minutes in my Moleskine journal. Finished this one. Details here and here. You saw the start of this here. I'm going to the Houston Quilt Festival in November, and I'll teaching two Make It University workshops...I'm thinking of doing one with needle-felting/embellishing...I'll keep you posted. Wearing my Punjammie pants (buy some, it's a good cause) and the scarf I tye-dyed. 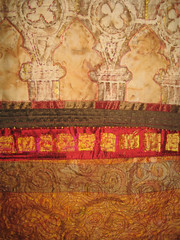 Here's another section of the quilt I'm working on, "Basillica San Marco" and I'm pretty proud of it. I wanted to depict Byzantine brocade, as I imagined it in Venice in the middle ages. 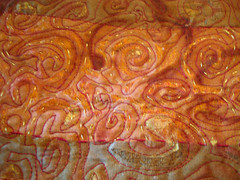 Starting with dupioni silk, I overlaid rusted organza, then free motioned stitched it, cut it to expose the silk, then hand stitched with gold thread. One of the hallmarks of making ART is that first, you think of what you want to say, or portray, THEN you select the materials to create your content. 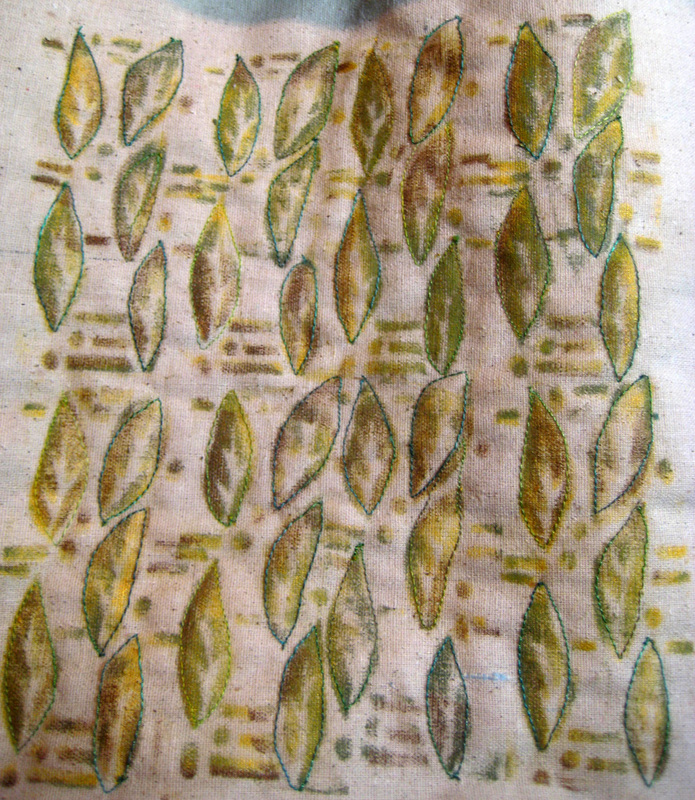 That's what I've done on this quilt, rather than let the techniques drive the piece. And frankly, I very much like the way the piece is coming together. It's very true to my goal, which is to portray my impression of Basillica San Marco and old Venice. Another needle-felted start. 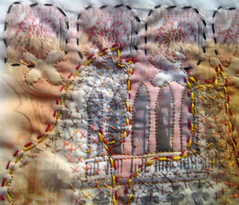 I free motion stitched some shapes to begin. Now to the hand sewing. 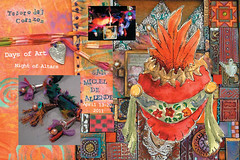 Quilt Visions members and guests are invited on September 19th for our annual meeting held in Room 1 in the Command Center Building next to the Visions Art Quilt Gallery, in San Diego (Point Loma area). You will meet the new Quilt Visions Board members and hear about exciting changes for Quilt Visions and the Visions Art Quilt Gallery. 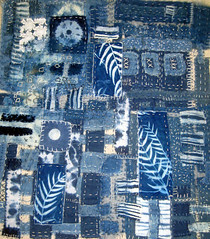 After the meeting artist Jane LaFazio (that would be me) will give a presentation about her role as the SAQA SoCal rep and her observations on current trends in art quilting. She will also talk about the benefit of social networking and how she has used it to her advantage. 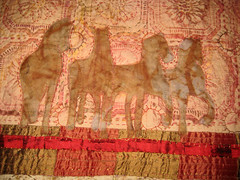 If you haven’t already seen the terrific traveling exhibition, “Transformations: Reflections” from SAQA,(Studio Art Quilts Associates) you’ll want to give yourself plenty of time to see the 34 breath-taking quilts in the gallery. Just finished a proposal for this workshop, entitled "BIG BOOK." You can see the pages of the book here. Hope to be teaching it, near you, in 2011. This is how all my needle-felted pieces begin...with color! 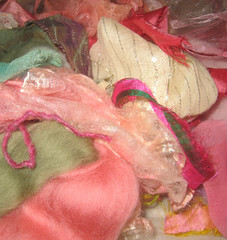 Some bits from Suzanne Morgan's everything kits, and sheers, ribbons etc from my own stash. I'm starting a bunch of new pieces. 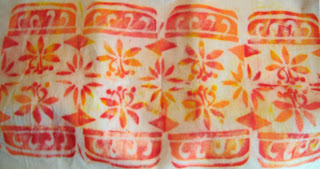 Four needlefelted pieces, and two monoprints on fabric. They are all ready for me to begin hand-stitching. 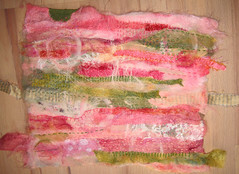 And, I'm preparing another 'machine needle-felting tutorial' so stay tuned! Meanwhile, this one started with a beautiful 'everything kit from Suzanne Morgan (Roses). I don't usually work in pink and green, but it looked so good in her little bag, that I went for it! I'll keep you posted on the progress. Oh, and you can see details of this here and here. Doodling on the airplane. 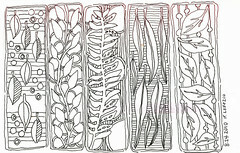 I will probably add some color to this page....I'm working on some proposals for workshops, incorporating elements of nature.....I'll use these designs, somehow, in my sllyabus.. 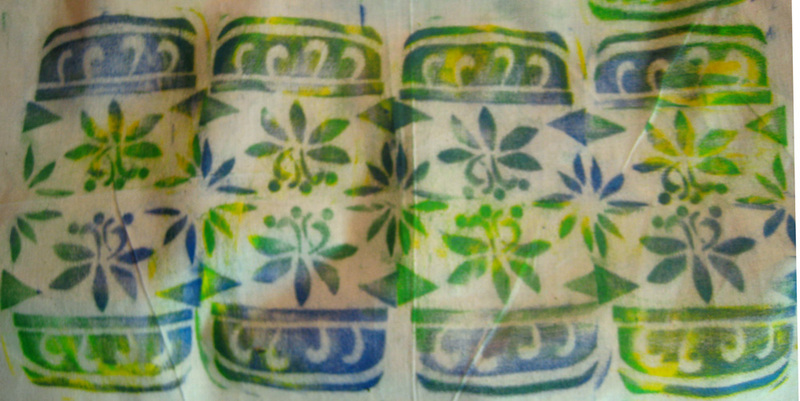 Remember, I tried my hand at a Gloria Hansen inspired digitally printed quilt. Here's a corner of it. (It's only 8x11") I have a new appreciation for Gloria's work. I've stitched the heck out of this, and you can tell, it's just not makin' it. No "reason for being" as I tell my students. I did add some additional color, with color pencils, but I need to rethink this piece. It's in seriously need of a focal point! By the way, note on the upper right hand corner of my blog, you can sign up for my emails. I'm sending occassional art-related spiffy new email newsletters now, so, if you're interested, please sign up. THANKS! Clearly this photo was taken BFP (before food poisoning) at CREATE, by Pokey Bolton no less. Melly Testa has created a way cute video of the CREATE experience, and since I'm was lame at documenting it, go check out her take on the fun. This is a needlepoint (partially stitched) based on my original painting . My friend and needlepoint designer Cassandra Prescott created it. She is Sundance Designs and you can see the canvas here. Cool huh? 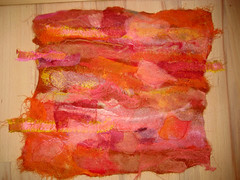 I did needlework for nearly 25 years--from kits--and now I have one created from my artwork! cool!